1 How Do Ice Melts Work? 3.1 What Types of Ice Melt Are Dangerous? For at least a short time each year, we all like having a winter wonderland. But snow and ice tend to cause major problems on our driveways or walkways. The snow can be shoveled out of the way with a good snow shovel, or blown away with an electric snow blower. However, ice is a bit more complicated to remove. So what’s the best way to clear up that slippery ice in the dead of winter? Ice melts! How Do Ice Melts Work? Ice melting compounds drop the freezing temperature of water, which causes snow and ice to melt and helps prevent it from refreezing. Some varieties of ice melts will soak down through thick ice or snow and cause a brine to form at the ground level, which makes the ice or snow easier to remove. Other types just cause the ice to turn to a soft slush that’s easily scooped or swept away. While the oldest and most common form of ice melt is simple rock salt, there are a wide variety of chemical compounds that are used today. 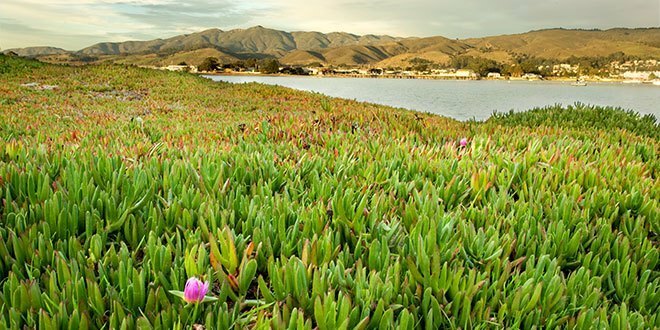 However, some may not be safe for use around pets, or may cause plant life in the runoff to have problems. A few varieties are even known to pit the surface of concrete! So it’s important to know what you’re using and how it will react before use. All deicing compounds have a certain temperature range at which they start being less effective. Generally, effectiveness is gauged by the ice melt working within about 15-20 minutes after application. Most seem to be at their most effective in temperature ranges of 25° F to -25° F, although each type will vary. Nearly all ice melts have potential side effects. 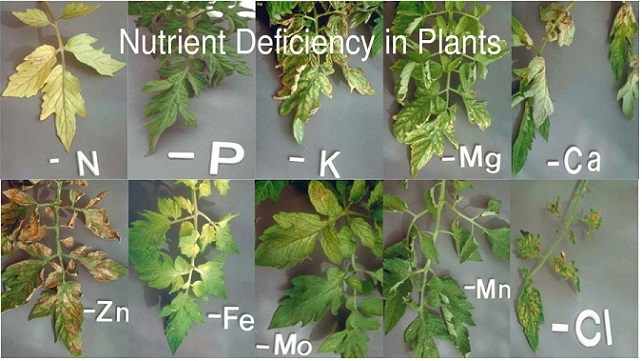 They may have detrimental effects on plants, or are not safe if consumed, etcetera. Overall, when measured up against the dangers of slippery ice and snow in the wintertime, it’s generally understood that they’re still necessary. But there are some types that are safer than others. Let’s examine deicing compounds in a bit more detail by exploring the active ingredients that cause the ice to melt. Each type of ice melt will either be primarily one ingredient from this list, or a blend of rock salt with one of the other active ingredients. While this is the most common ice melt, and certainly the oldest, as an ice melt salt is not the fastest to work. Effective only down to 20° F, after which the ice melting properties slow significantly, it’s often used as a bulky base for ice melt blends as it’s extremely inexpensive and widely available. It’s crystalline in structure, looking more like rocks than like pellets. Rock salt is often used for road deicing, but it leaves behind a whitish, powdery sodium residue, and too much runoff from rock salt will kill plants. 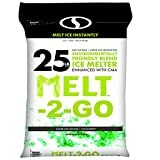 This is one of the most effective ice melts in the industry, as calcium chloride can melt ice and snow down to -25° F. Available in a pelleted, flaked, or powdered format, as well as liquid ice melters, calcium chloride is also one of the more expensive choices, although it takes very little to be effective. While small amounts of calcium chloride are commonly found in fertilizers, this is one of the ice melts that can cause plant yellowing in extreme quantities, which means your lawn or border plants may be at risk. It may also cause some pitting in concrete, and is slightly corrosive to some metals. Potassium Chloride will melt ice in temperatures down to 12° F, and urea to 15° F. Both of these products are commonly considered safe to use around vegetation, as both are often added to fertilizer blends. A super-refined form of potassium chloride has been used as a salt substitute in food, but road-quality potassium chloride should never be eaten. 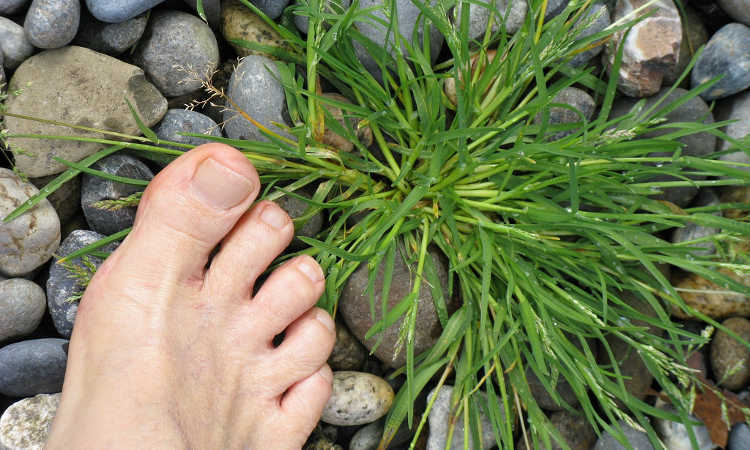 Too much of this in runoff spilling into your lawn or garden may cause high levels of potassium in your soil and require balancing. Melting in temperatures down to 5° F, magnesium chloride looks like a finely-flaked white material. It is less corrosive than calcium chloride or sodium chloride, and slightly more eco-friendly on plants. Initially it will start the melt process as fast as calcium chloride will, but it can get diluted and become less effective. Over years of use, it will start to cause pitting in concrete. Sodium acetate is commonly used as a runway deicer. It is active down to 0° F, and is exothermic, meaning it gives off heat as it dissolves. It is typically a powder, and can be spread over a wider space with a much smaller quantity. Calcium magnesium acetate (CMA) is used by Caltrans and other U.S. state road systems to protect older highways. It is spread over roads prior to ice formation, and rather than cause melt, it causes ice molecules to stop sticking to one another, keeping material slushy and improving traction on roadways. It is unpalatable to animals as it smells like vinegar. CMA tends to be far less likely to damage roads or metals, and is generally ecologically safe. 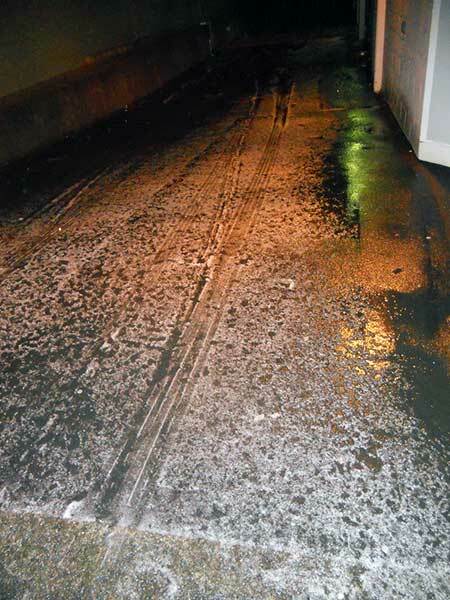 If you want an ice melt safe for concrete, CMA is an excellent choice. There are two kinds of glycols which are commonly used in ice melts – ethylene glycol, and propylene glycol. Ethylene glycol is incredibly effective, and is often used as an airplane deicer. It can reduce the freezing point of water to an incredibly low -58° F. However, ethylene glycol also is poisonous to humans and animals, and thus is relegated mostly to use on the exterior of airplanes. Propylene glycol (PG) is nontoxic to plants, pets and animals. In fact, it’s often used in food flavorings and cosmetic products. In recent years, it has replaced the use of ethylene glycol because it can lower the freezing point of water to almost -75° F! It’s available in some pet-safe ice melt blends. As PG is a liquid, it’s generally mixed with some form of traction-enhancing, porous granular material. So, when you purchase a granular ice melt that uses it, what you’ll see is the traction-enhancer rather than the colorless liquid PG. A quick note about ice melt blends here: the vast majority of blended ice melts are mostly made up of rock salt with little of the other active ingredient(s). So, for instance, you may buy a blend to discover that it’s 95% rock salt, and 5% calcium chloride. More often than not, blends work almost identically to pure rock salt even if they do have other deicing ingredients, and the only benefit may be a very slightly lowered temperature that the melt will work in. This doesn’t mean all blends are bad, and I’m even going to recommend some! But be aware of what’s in your ice melt. You don’t want your ice melt to damage your garden or lawn, or even your driveway. However, even more important is the risk to yourself, your children, or your pets. Let’s figure out what’s most dangerous to you and your family, and learn how to protect yourself against those problems. What Types of Ice Melt Are Dangerous? While all types of ice melt should be handled with caution, here’s a short list of dangers to people or pets associated with different varieties of ice melt and how to avoid them. Sodium Chloride: Too much salt can dry out paw pads on cats and dogs. Also, while pure salt is okay to eat, too much is, and road-grade rock salt may contain other ingredients and other deicers. Don’t eat it! 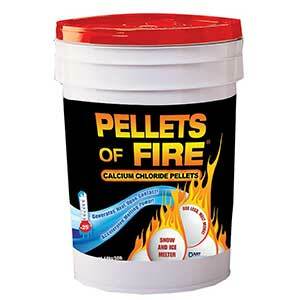 Calcium Chloride: Handle with caution. May cause stomach irritation if ingested, skin and eye irritation and burning if gotten in the eyes, or respiratory issues if inhaled. Potassium Chloride: Breathing in the dust while spreading can cause cough/sore throat, and getting the dust in your eyes can cause redness and eye pain. Ingesting it can cause nausea, vomiting, weakness, and convulsions. Magnesium Chloride: Avoid breathing the dust as it can cause significant irritation, and do not get the dust in your eyes. May cause light irritation to skin. Ingestion causes nausea, abdominal discomfort, and vomiting. Acetates: Avoid getting these in your eyes or inhaling them as they can cause lung and eye irritation. Wear gloves while spreading, and wash thoroughly afterwards. Be sure to rinse off animals’ paws after walking through acetates. Glycols: Ethylene glycol is poisonous to humans and pets, but has a sweet flavor that can entice animals to taste it. Seek medical assistance if consumed. Propylene glycol is nontoxic. One common alternative to using a lot of any ice melt is to spread a coarse grained sand along with your ice melt. This will provide a rougher surface for more traction, but will reduce the need to use as much deicer in light ice and snow conditions. 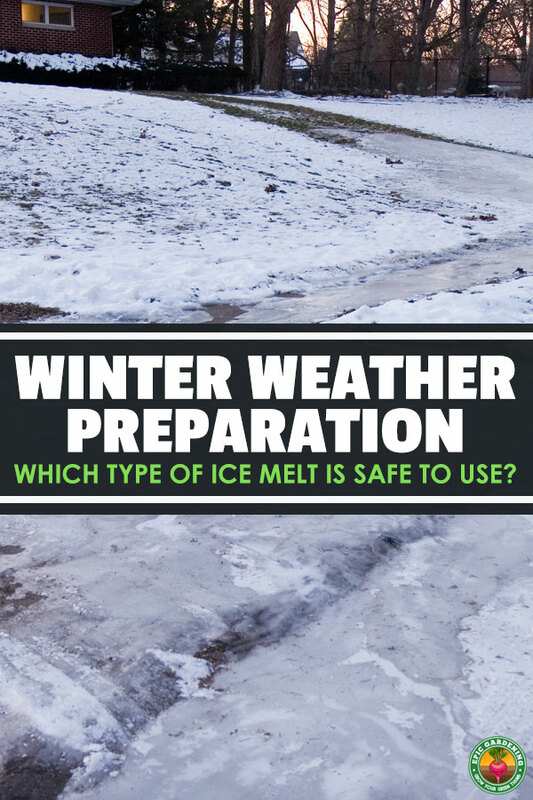 This can help protect you or your property from the potentially-damaging aspects of ice melts. Remember, sand will not melt the ice or snow, so it’s not a replacement for the melting compound, just an alternative that can help reduce the need for the melts. Small children are notorious for picking up things (especially brightly-colored things) and putting them in their mouth as if they were candy. And I don’t know about you, but my dog is willing to eat nearly anything. Needless to say, keeping a close watch on children and pets when they’re around ice melts in use is essential. Don’t let your children or pets eat snow that may contain ice melt residue, and especially prevent them from eating the ice melt pellets or granules. Another consideration is leaving brine created by ice melts on the skin. Little children’s hands should be rinsed off when they come inside. Similarly, your dog’s or cat’s paws should be given a rinse in warm water after they’ve been out in the snow. For dogs, it is also wise to check their feet to be sure there aren’t any granules of ice melt stuck in their paws, as that can cause burning of their paw pads. While flaked melts tend to be a more dog friendly ice melt choice as they’re less likely to get caught in the paws, they may be poisonous, so proceed with caution! If you want to be absolutely sure that your children or pets are safe even when you’re not around, use an ice melt that is completely nontoxic, child and pet safe. They may cost more, and they work a bit slower, but it’s worth it in the end to have the knowledge that your family is completely safe. 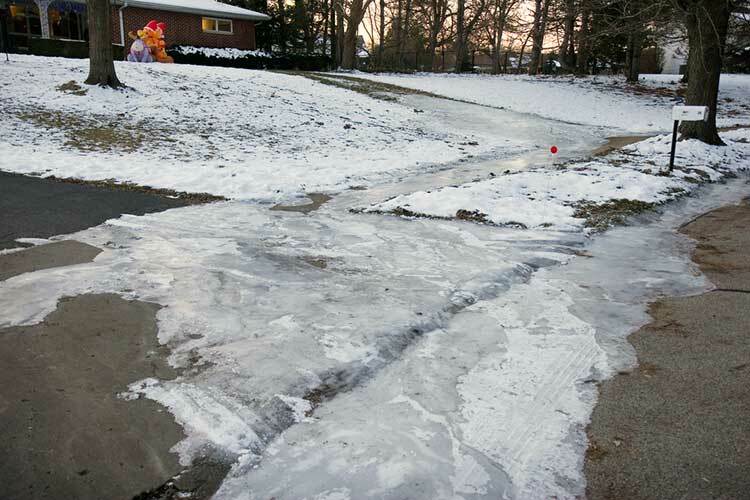 Every type of ice melt has a recommended amount to use based on the area that you’re covering. It’s best to always use the least amount of the product possible. It’s very common to use too much in an effort to get the ice and snow to melt faster, but it doesn’t actually help, and it can cause a lot more concentrated runoff into your lawn. Please read your manufacturer’s directions for application and follow them. If you find that you want added traction, spread something like coarse sand or a nontoxic traction additive like Traction Magic over your sidewalks, driveways, or pathways. If you receive heavy snowfall, the ice melt should keep it from freezing to the ground and enable you to shovel it later. However, you may need to reapply granular ice melts after shoveling, so check your manufacturer’s directions to confirm. I usually wouldn’t recommend a pet safe ice melt without seeing a full list of all ingredients, but seeing the manufacturer’s safety data sheet for Safe Paw convinced me. This stuff is as non-toxic as you can get in a commercial ice melt. The manufacturer describes it as a proprietary blend of carbonyl diamine and a glycol admixture online, which tells me it’s likely a propylene glycol and urea blended melt. Coated urea (the above mentioned blend) tends to be extremely safe to use. It’s also environmentally friendly. After I wrote this piece originally, the manufacturer provided a little more information on the history of their product as well as a bunch of independent lab results on Safe Paw. And once I read through the data, I really had to update this piece, because my entire view of what the best choice was had dramatically shifted. Safe Paw was originally created as a deicer for the sensitive areas of nuclear power plants where any contaminants could rapidly become a risk factor. Over time, they improved it until it was safe to use on even the most critical areas. At the time, it was known as Safe Thaw. It was then that the makers of the product found out what mineral salts did to animal paws the hard way, with one of their own pets showing signs of ice melt damage. 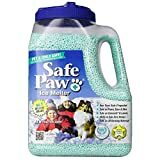 As a result, the manufacturer rapidly reworked their product to make it a fully pet-safe, non-toxic and salt-free ice melt, changing the name from Safe Thaw to Safe Paw. Safe Paw will melt a half inch of ice in about ten minutes’ time. If used as directed, it is completely non-toxic. Care should be taken when spreading it to avoid breathing any fine particulates. This helps prevent minor irritation of the nose/throat. Similarly, keep any dust out of the eyes, as that can be a minor irritant there as well. Otherwise, it’s about the safest stuff out there around humans and animals. It’s also safe for your concrete, provided that your concrete was laid down properly to begin with. An FAA study showed that it was fully within their guidelines for airport use. This makes it highly unlikely to cause any sort of damage to your driveway. Some of their data also showed it was even safe on fresh concrete that had only been poured three days prior! Still, there are two extremely small drawbacks. The first is that it starts deteriorating in melting capability below -2°F, so it won’t work as effectively in the -10 chill of a North Dakota winter, or in even colder climates. For that sort of extreme conditions, you’re still stuck using a calcium chloride melt. The second is its color. While the color definitely helps you identify where you’ve spread the product, which is good, it also may be mistaken as candy by a two-year-old. Anyone who’s had much experience with a toddler knows that everything goes into the mouth. Safe Paw added a bittering agent to the product, so they report that if children eat it, they typically spit it out and never touch it again. While it won’t hurt them if they eat a few granules now and then, I doubt that there’s been an in-depth study of what might happen if a toddler ate multiple handfuls. With this, as with so many other things, keep the container out of the reach of children. With all of this new information, I really have to push this to the top of the list. 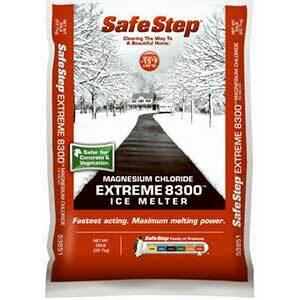 So while this is still the safest ice melt for pets and children, it’s also my highest recommendation. Unless you live in an extremely cold place, Safe Paw will melt your ice in the safest way for you, your family, your pets, and your property. Pros: Melts ice extremely well and at extremely cold temperatures. Cons: Not as environmentally-safe or concrete-safe as other types. Use caution around children and pets, wash paws/hands/feet after contact. You just want to melt ice. You want to melt it fast. You want it to disappear and leave nothing but a wet driveway behind. Well, then, this is what you need. 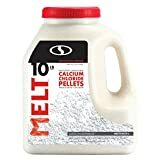 This is the purest calcium chloride snow melt that I could find on the market, and calcium chloride is the fastest melt ingredient out there. 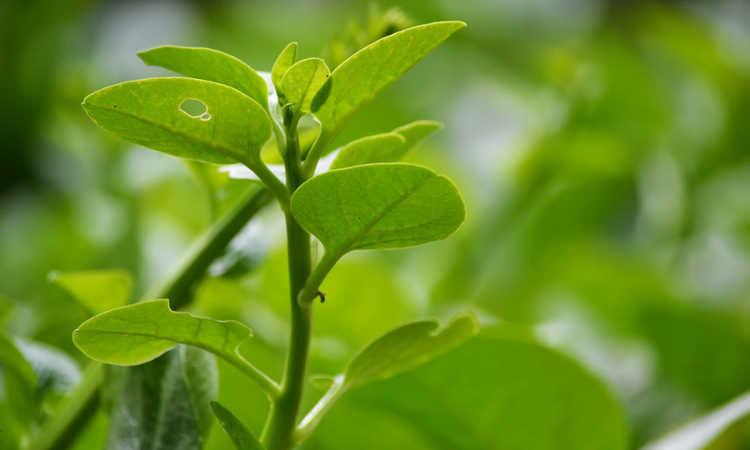 If used as directed, the manufacturer claims that it is safe for plants and on concrete, although there are other options that are more eco-friendly. But for the purpose for which it’s designed, this really works incredibly well. It knocks out snow and ice with ease! If I could, I would recommend an all-CMA option for concrete, as calcium magnesium acetate is by far the safest ice melt component to use on one’s property (both in terms of damage to concrete and to the plants). However, CMA is very expensive on its own, so it’s usually found in a blended format. This one combines rock salt, the less-ecologically-impacting magnesium chloride, and CMA together to create a very effective and surprisingly inexpensive ice melt choice. It works into the low negatives. Although it won’t conquer all cold extremes, it’s commonly used and widely available in the United States, and is a very functional option for property preservation. While I could easily recommend the Snow Joe option for plants as well, the reality is that if you’re not as concerned about pitting or cracking in the driveway or sidewalks, there’s a better choice. The Extreme 8300 is very plant-safe if used in recommended quantities. While overuse can cause some light chipping or cracking in the concrete, it’s fine during normal use as well. One thing to know about using pure magnesium chloride is that you should use a plastic container to spread it, rather than gloves. The chloride salts will rapidly cause your gloves to stiffen and crack, leaving your hands exposed. A shaker jar or even just an old plastic cup will work to sprinkle it where it needs to be. Normally, I prefer ice melts that avoid the rock salt, just because salts can build up in the yard. But in this case, it’s such a balanced blend of salts that I’d be willing to give it a shot. While the manufacturer cautions only to use it on concrete that isn’t freshly-cured, it’s concrete safe, and the blend of chlorides should be generally plant safe, too. But it’s still a risk to young children and pets who might eat it or get it on their skin, so exercise caution. This calcium chloride is very close to my top choice — it’s 94% pure as opposed to 96%. However, what it loses in percentage, it makes up for with an extremely reasonable price. 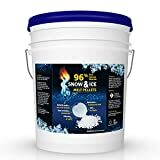 It has all of the issues which calcium chloride ice melts are liable to have, but it also melts with great speed and ensures that you can walk and drive safely. All things considered, for the price, this is a value, and quite effective in colder environments. My biggest complaint with this particular brand is that it advertises itself as a calcium chloride ice melt, and yet it has more than one active ingredient. Having said that, it comes in a large 50-pound bucket, is moderately well priced, and works quite efficiently for what it is. It would not be my #1 pick, but it also would not be my last choice. As you can see, there’s a whole lot to know about snow melts, but I hope I’ve helped you narrow it down somewhat. Whether you’re looking for a melt that won’t kill the grass next to your driveway, one which won’t hurt the dog, or one that just melts ice as fast as can be, there’s a choice out there for you. Do you have a preferred ice melt? Let me know! 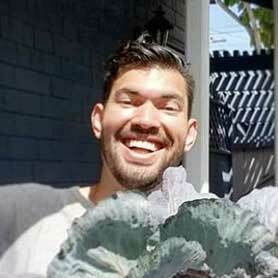 This article was originally published on Sept. 20, 2017, but was given a major update on October 30th, 2017. You should research liquid pretreatments. It is obvious that a liquid is better for paws because there are no pellets to get trapped into a paw. Also the liquid form allows different ingredients to be used that are not toxic and irritating like pelleted products are. For example, Safe Paw relies heavily on anti freeze inputs to work (ethylene glycol and propylene glycol) very dangerous to your pet. Ethylene glycol is specifically mentioned in the segment on pet and child safety, and is warned against as it is in fact toxic. Thankfully, it’s generally only used for airport runways, and is not commonly found in home products such as ice melts. By contrast, propylene glycol is utilized in toothpaste, lotion, shampoo, other soaps, and a number of other common household goods. It’s also used medically as a base for inhalers and is the most common ingredient for the liquid used in fog machines (although some companies opt for vegetable glycerin instead). Considered “generally recognized as safe” by the FDA, it’s extremely widespread in its utilization throughout the world. Incidentally, another common component in antifreeze is water. As we all know, H2O is nontoxic and safe for pets and humans — and in fact annoying in its crystallized form, which is why we use ice melts in the first place! As far as Safe Paw itself is concerned, there’s a link in the review to the manufacturer’s safety data sheet (MSDS), required by law on chemical compounds and handled by an outside laboratory. I definitely encourage you to go take a look for yourself before condemning the product. Liquid pretreatments are a great idea for a piece, though, so we’ll definitely look into that for the future! Our condo is using a white granular snow melt that seems to have a petroleum base. It has stained the parking lot and outside hallways. It sticks to the bottom of shoes and pet feet and is tracked into our homes leaving Foot prints and prints everywhere. It requires a soap solution to remove. Do you know what type of melter is being used that would have this effect?? ?